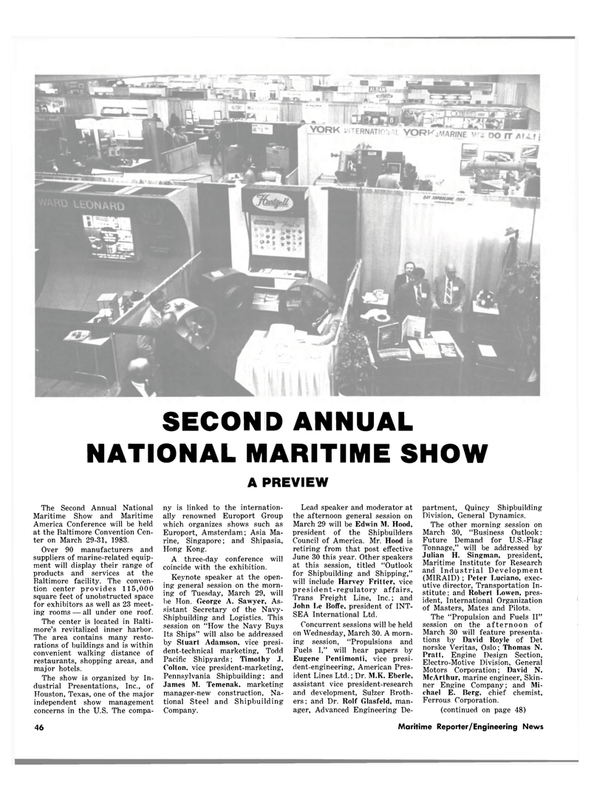 America Conference will be held at the Baltimore Convention Cen- ter on March 29-31, 1983. Baltimore facility. The conven- tion center provides 115,000 square feet of unobstructed space for exhibitors as well as 23 meet- ing rooms — all under one roof. The center is located in Balti- more's revitalized inner harbor. The area contains many resto- rations of buildings and is within convenient walking distance of restaurants, shopping areas, and major hotels. A three-day conference will coincide with the exhibition. Maritime Institute for Research and Industrial Development (MIRAID) ; Peter Luciano, exec- utive director, Transportation In- stitute ; and Robert Lowen, pres- ident, International Organization of Masters, Mates and Pilots. March 30 will feature presenta- tions by David Royle of Det norske Veritas, Oslo; Thomas N.